1 pc. 5,47 EUR ea. from 3 pcs. 4,70 EUR ea. from 10 pcs. 4,02 EUR ea. from 20 pcs. 3,68 EUR ea. from 40 pcs. 3,39 EUR ea. Bestseller: Already more than 30 000 sold! 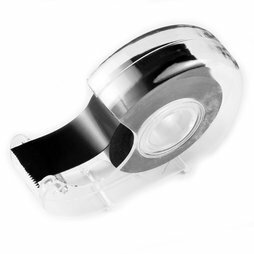 Extremely handy: An adhesive tape in a dispenser that is both adhesive and magnetic. It attaches photos, postcards, and other lightweight things easily and flexibly to ferromagnetic surfaces, without making holes. The magnetic tape is suitable for hanging up small and light paper or thin cardboard items on the refrigerator, the whiteboard or the blackboard. Just like a standard adhesive, pull the desired length from the dispenser and cut. Important: For larger items or thicker cardboard you definitely need to use a self-adhesive magnetic tape, like the Magnetic adhesive tape ferrite 20 mm, with its 8 times higher adhesive force. With that, you can hang up even heavy objects. The tape is not a suitable magnetic surface for magnets. They would demagnetise the tape. A better surface for magnets would be our magnetic strips. 20 pcs. 0,29 EUR ea. 1 pc. 4,17 EUR ea. Simply attach the adhesive side of the magnetic tape to the backside of a photo or postcard and in no time the photo or postcard attaches on the refrigerator door, whiteboard, metal cupboard, etc. The magnetic tape can also be used for attaching quick notes.